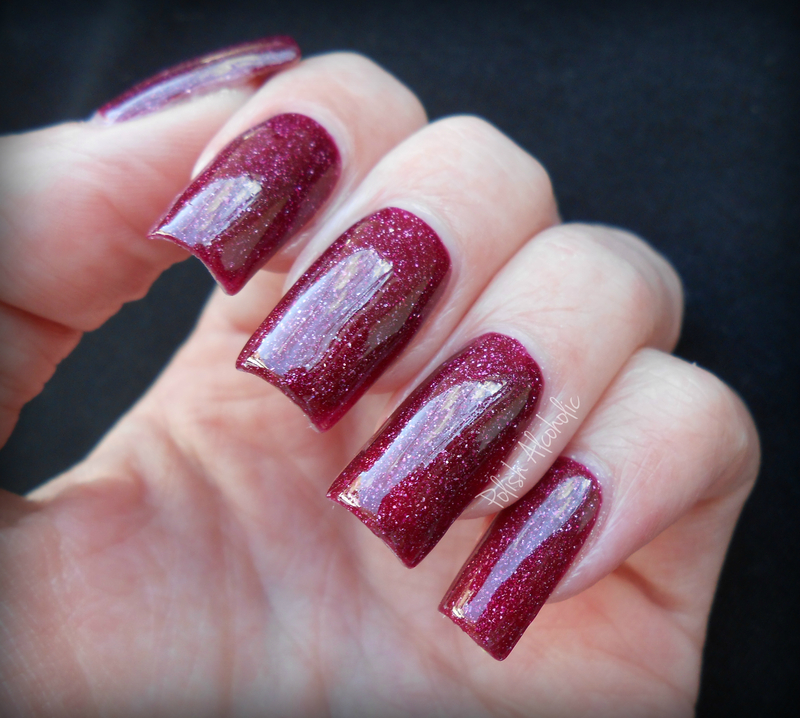 “A classic Hollywood icon”… Monroe This stunning deep red jelly base with scattered holographic shimmer is called Monroe. What a fabulous name don’t you think? This was love at first sight. Three of my favorite things in one bottle, red, jelly and holo. The formula is perfect. Drying time is, like every jelly, average. I used two easy coats of Monroe plus top coat (Seche Vite). I have a few polishes in my stash from the same (scattered/glitter holo) family as Monroe, so I did a little comparison to see if there are similarities. Let’s take a look: No dupes here! Monroe has the most similarities with OPI’s Extravagance. They both have a very fine holographic shimmer. Color wise: Monroe is a deep blood red while Extravagance is more a rich purple. Zoya’s Blaze is way brighter than Monroe. And Zoya’s Aurora has more holographic glitter instead of fine shimmer. What do you think of Monroe? 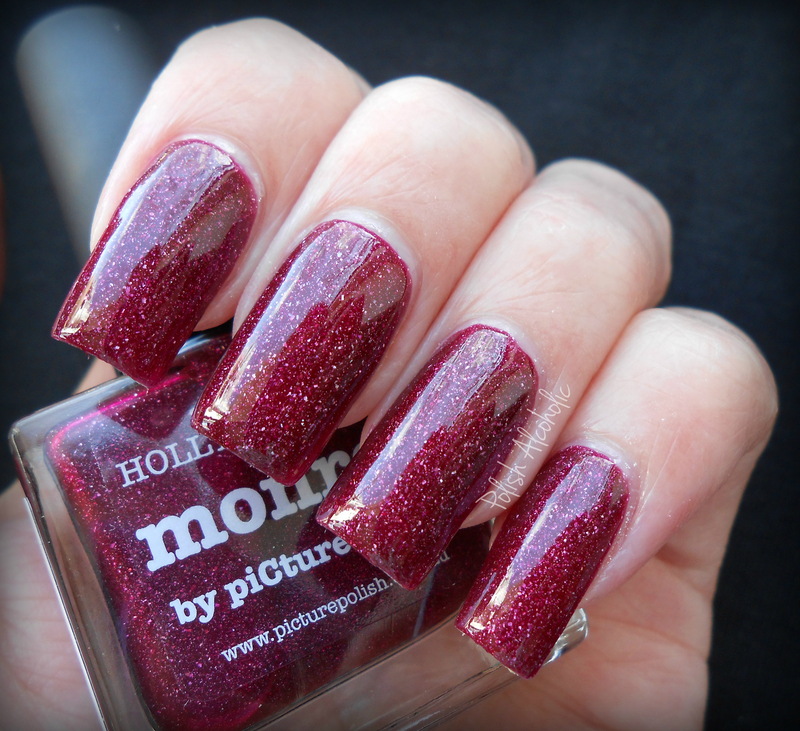 For my girls here in The Netherlands: piCture pOlishes and Ozotic polishes are available through Petra’s webshop: Pretty Polish! Can’t find the one(s) you’re looking for? Petra is always willing to kindly answer your question(s) through the contact form. 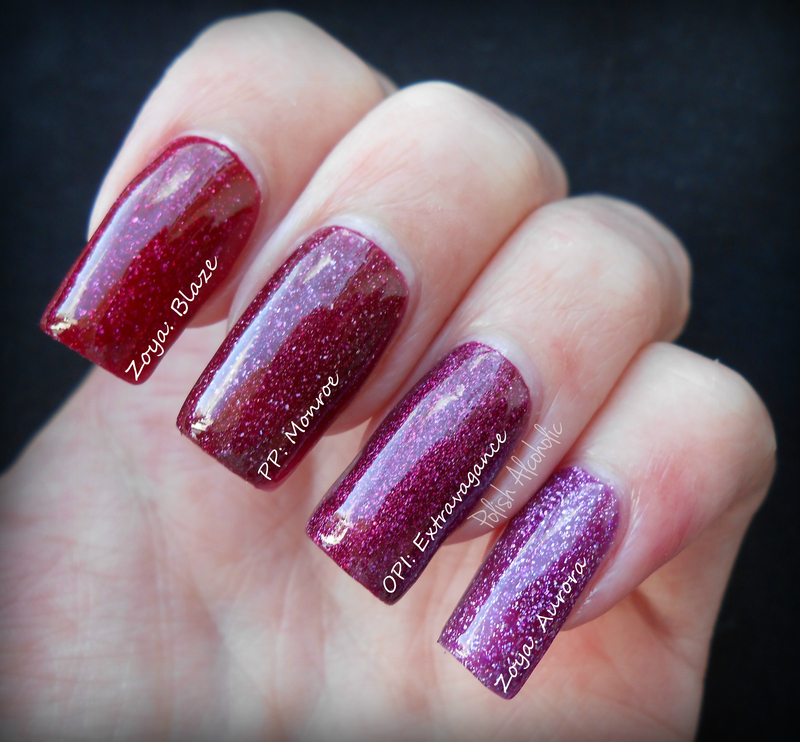 And of course you can find Pretty Polish on Twitter and Facebook too! This entry was posted in Indie, piCture pOlish and tagged holographic, picture polish, picture polish monroe, picture polish monroe swatches, picture polish swatches by Polish Alcoholic. Bookmark the permalink. I LOVE Monroe! Great comparation! I was wondering while I was wearing Monroe how close it was to Blaze! OMG this last picture, i didnt knwo where to look first – i love them all………! omg so pretty! I never get tired of looking at this one! Reds last forever in fashion! 😀 It does! One can never go wrong with red! A Jelly holo? I love it. HOLLA! That are my thought too 🙂 Awesome ha! i’m not really into reds on my nails but this one is super pretty 🙂 Love the website from Petra too. Pretty Polish is awesome!